The AfriSAR campaign is in its second week of collecting data over different forests of Gabon using airborne radar and laser instruments, UAVSAR and LVIS. While most of the NASA airborne crew are located in the City of Libreville supporting the data acquisitions and logistics, the science teams have been busy collecting data on the ground to compare and verify the airborne observations. 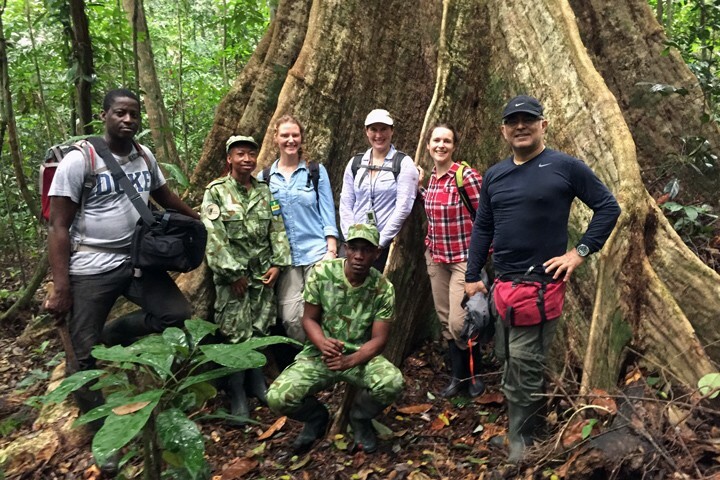 A group from the NASA team drove to the center of Gabon to visit Lope National Park, a study site well known for its diversity of forests and animals, and its attractive landscape. Lope covers an area of 4948 square kilometers; it has been a wildlife reserve since 1946 and national park since 2002. The study site for AfriSAR is an area of about 500 square kilometers located in the north of the park covered by savanna grasslands mixed with forests of different types and structure. In addition to measuring the study site with all airborne sensors, we are also mapping the entire national park for the National Park Service of Gabon (ANPN) with the UAVSAR radar. On March 1, during the UAVSAR flights over Lope, Laura Duncanson from NASA/GSFC and Suzanne Marselis from University of Maryland (both from the NASA GEDI team), and Victoria Meyer and I from NASA/JPL (from the NISAR team) were on the ground collecting tree structure and soil moisture for both lidar and radar studies. Before we arrived to the forest, we saw an elephant with her calf strolling along the edge of the forest and enjoying the fresh and cool hours of the morning. The sighting reminded us that unlike the tropical forests of the Americas, the large animals known as the African mega fauna are a major part of the ecosystem, shaping the forest structure and its dynamics. This time of the year, more than a month into the rainy season, most semi-deciduous trees in Lope are fruiting and flowering, providing nutrition for the forest and its animals. Before going to the field, we were advised by the park rangers to watch for the presence of elephants and gorillas in the forest feeding on fresh fruits. The measurements in the field were collected in an existing network of biomass plots distributed in young and old forests and extending from the edge of the savanna to more than a kilometre into the forest. The GEDI team established small plots to simulate the 25-meter GEDI footprint, and recorded tree height and diameter, crown size, and forest canopy cover. The lidar sensor on GEDI will start sampling the Earth’s forests globally from the International Space Station sometime in 2018. 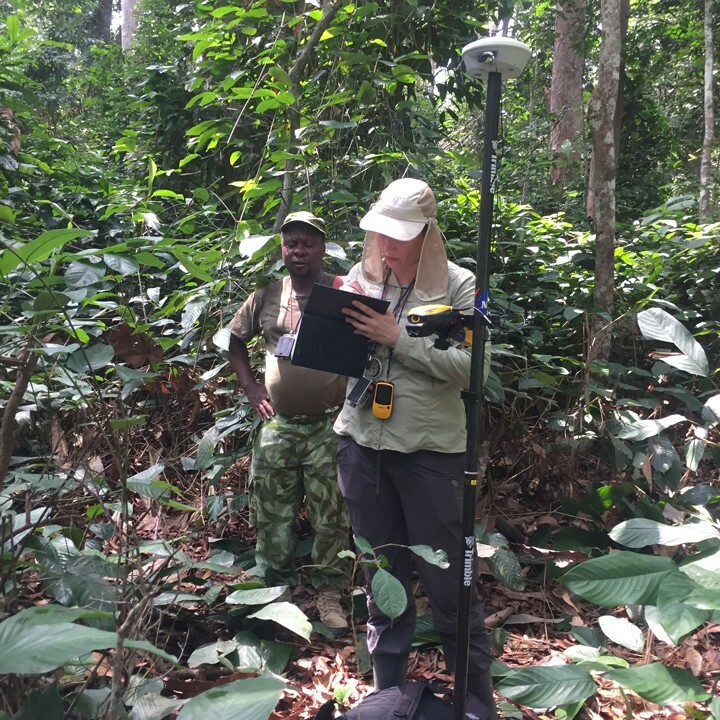 LVIS provides similar measurements from the airborne platform giving the team an opportunity to examine the performance of GEDI before its launch in a complex forest. LVIS flew over Lope on March 2 and collected data over the study area coincident with ground measurements. The NISAR team concentrated in taking samples of the soil moisture in areas where tree structure is measured during the UAVSAR overflights. The goal of these measurements was to quantify the effect of the moisture on the radar measurements of the above ground biomass. The radar signal penetrates into the forest canopy, bouncing back from tree stems and branches that contain almost the entire forest biomass or carbon stock. Depending on the density of the forest canopy, the radar measurements may reach the soil surface and reflect back, introducing errors in measurement of forest biomass. The NISAR mission will be launched in 2020 and is designed to cover the global vegetation wall-to-wall every 12 days to measure biomass with precision by removing the effect of soil moisture. For both GEDI and NISAR missions, Lope provides an ideal site with open and closed canopy forests, covering a range of biomass and giant trees scattered over a landscape with different slopes and moisture. 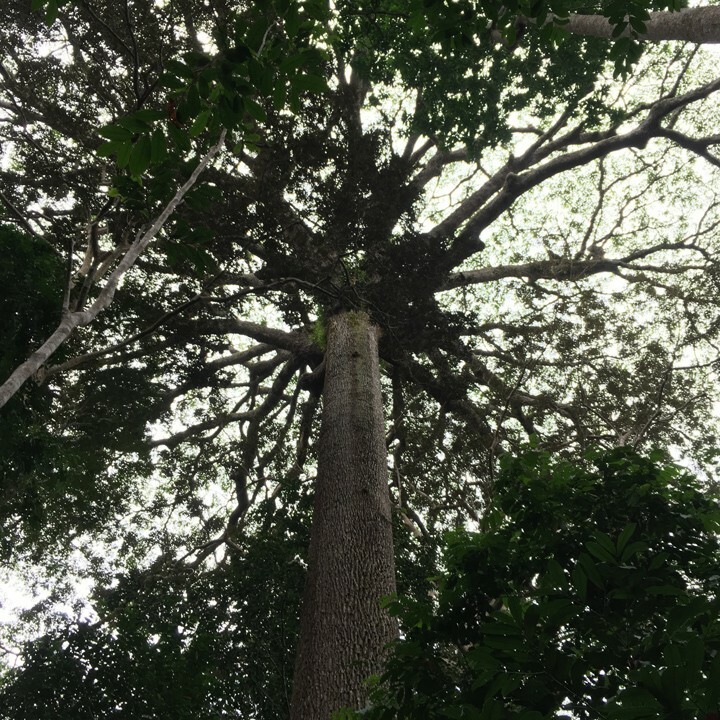 On the day of UAVSAR flight, the team encountered a giant Moabi, one of Africa’s most spectacular trees, more than 500 years old, standing tall up to 60 meters in height and with a majestic crown casting shade over a large area of the forest about half the size of a football field. Moabi trees have succulent fruits used by animals and seeds for cooking oils used by humans. Elephants swallow and disperse the seeds reinforcing the cycle of regeneration in the forest. Both the smell and the sound of falling fruits weighing about 250 grams can attract elephants to the site of the Moabi. Elephants use low frequency calls, which carry over distances of up to 5 kilometers in the forests, to communicate to others to join the feast of fruiting in the park. 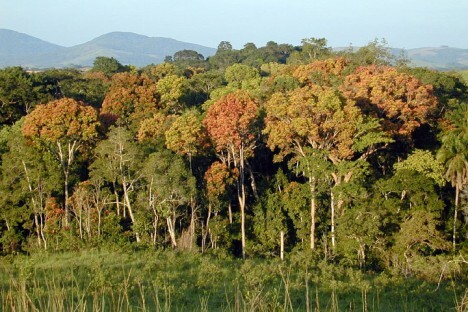 Moabi trees have been sought by loggers for their brown-pink and hard wood and are exploited all over Central Africa. Once the trees are cut, the chances of another one growing is slim as there are no seeds for dispersal, a scenario that may end in extinction of some of the wonders of the nature in Africa. Moreover, the loggers open the forests for poachers, who target elephants for their valuable ivory. Despite a ban on the international trade in ivory, African elephants are still being poached in large numbers. Finding a Moabi tree is a rare occasion. But here in Lope, both Moabi trees and the elephants are protected. While quantifying the structure of large trees in the field, we also collected soil moisture measurements at intervals of 20 meters in the plots to compare with the radar measurements at similar resolutions. The soil measurements were collected at the depth of 15 centimeters to capture the variations of moisture near the surface. A quick look at the data showed that Lope is significantly dryer than the coastal forests of Mondah, the location of another AfriSAR study site. The average total rainfall in Lope is 1500 millimeters a year, almost half of the rainfall in Mondah and the city of Libreville. Our soil moisture measurements reflected this difference in rainfall, showing dry conditions in the forests and savanna of Lope, except, under the shade of the giant Moabi, where it was cooler and moist. The large difference in rainfall does not reflect in how tall the trees may grow in these sites, and for the same reason in most of humid tropics. With climate and other environmental variables playing a much smaller role in predicting the variations of forest structure and biomass, direct measurements from remote sensing techniques from space may be our only chance to quantify the size of trees and their carbon stocks globally. Gabon is home to one of the most pristine rainforests on the planet—devoid of people and intact in most places, while rich in animals and plants. The Gabonese forests are representative of the Congolian tropical forests, altogether the second largest rainforest in the world after the Amazon. 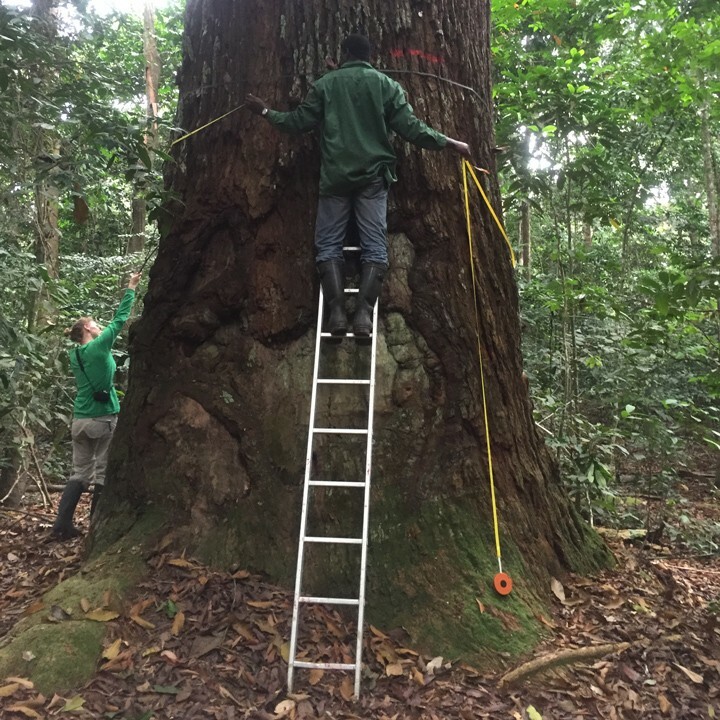 This makes the small Central African country the ideal field site for AfriSAR, a campaign to test technologies that will lead to future space missions to measure forests from space. 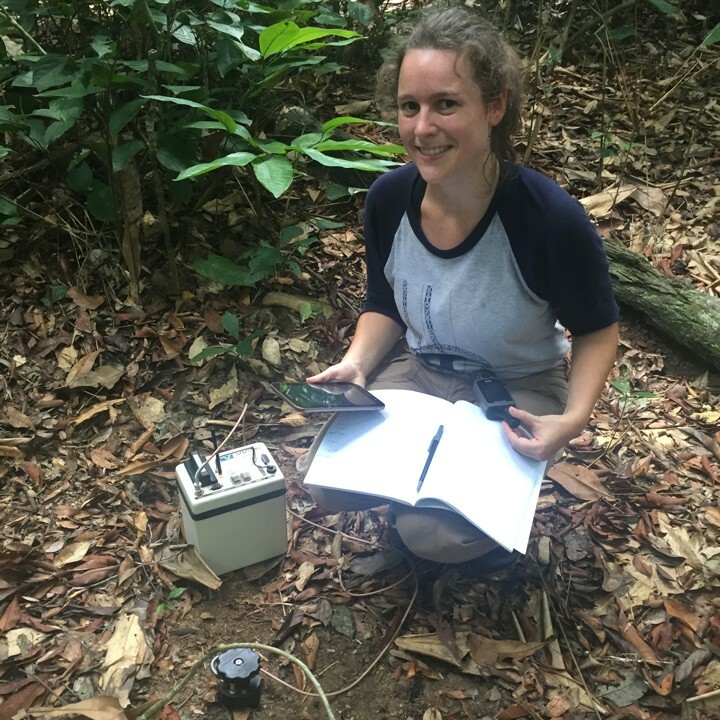 During two weeks in February and March 2016, NASA will collaborate with space agencies in Gabon and Europe to collect measurements of plant mass, distribution of trees, shrubs and ground cover, as well as diversity of plant and animal species—not only from Gabon’s rainforest but also from the country’s wetlands, mangrove forests, and savanna. 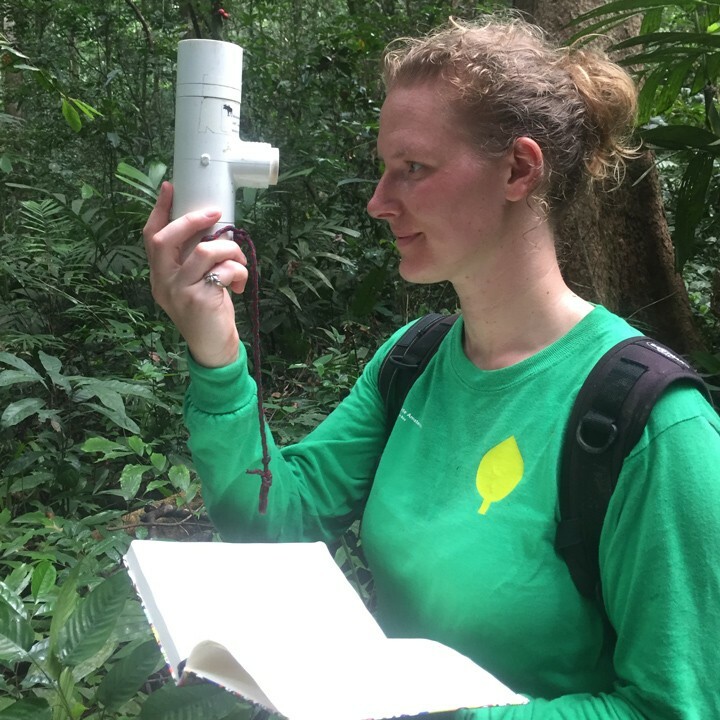 The data, gathered through airborne radar and laser instruments, as well as from ground teams, will improve our understanding of the role of forests in the carbon cycle. Scientists now think that the world’s forests absorb about a quarter of all the carbon dioxide we put in the atmosphere through the burning of fossil fuels, but to confirm this they need better studies of forest structure and biomass. To learn more about AfriSAR, read our release and watch the video here.